A group of Spanish and French researchers has described in the journal Science the first real-time observation of the birth and subsequent evolution of an electronic wave packet. In addition to providing the first ‘movie’ of the electron wave packet dynamics, and of the interferences that such dynamics implies, the high degree of control and high temporal resolution achieved by the study opens the door to the design of electronic wave packets in atomic and molecular systems, hence to control the electronic properties of such systems systems, which could have a direct impact on nanotechnology by allowing the design of materials with unusual electronic properties. The advent of attosecond physics (i.e., physics at the natural time scale of electronic motion) has opened the possibility of making ‘movies’ which explicitly show the wave behavior of particles and the interference phenomena associated with it. To measure the dynamics of the electronic wave packet (EWP) the researchers bombarded a helium atom with a train of attosecond light pulses, which induces ionization by two different paths, one direct (direct ionization) and one delayed (autoionization). Just as a wave interferes with itself as it travels along two different paths leading to the same destination (as in the famous Young Double Slit experiment, for example), the superposition of EWP generated by direct ionization and autoionization also leads to interferences, which show up in the form of peaks with an asymmetric Fano profile. To visualize the birth of such interference (the characteristic Fano profile), a second reference light pulse was used in time intervals of the order of 200 attoseconds. 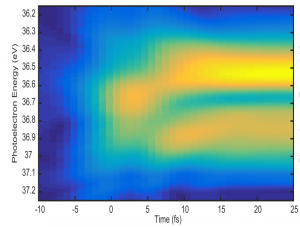 In this way, scientists were able to determine the amplitude and phase of the wave packet produced by the attosecond pulse train, and hence reconstruct the movie showing the birth of of the EWP and the subsequent establishment of the interference. As the figure shows, the interference between the two processes leading to helium ionization takes about 5 femtoseconds (5,000 attoseconds). Fig. 3. Dynamics of the EWP resulting from helium ionization. The evolution of the envelope of the wave packet with time is shown: time zero, the wave packet has a symmetric envelope with respect to its central position (36.7 eV). Approximately 5 femtoseconds later, the wave packet divides into two, giving rise to two asymmetric components whose shape evolves until it stabilizes at 20 femtoseconds. The splitting of the wave packet is due to interference between the direct ionization process, which occurs at time zero, and autoionization, which takes approximately 5 femtoseconds to occur. This entry was posted in News and tagged attosecond science, Electron wave packet, EWP dynamics. Bookmark the permalink.